How will it display when color choice more than 10? May I know how will color swatch display in category grid view when one product has more than 10 color choice? Will it overflow to outside of the area of product image like this? Is there a demo of this scenario that I can see before buying? I'm interested to buy this product but worried about the display issue. If your products have many colors, you can change display location to suitable with your site. And of course, we can custom and it doesn't overflow to outside of the area of product image like this. I hope that you will be satisfied with my answer. Does the customization(prevent color swatch overflow issue) complex, or not user friendly(become smaller block and hard to click for user), or need to pay extra? When you buy our product, if you have problems as you said above, we will custom free for you. I'll make purchase on next Monday as we have national holidays on this week in our country. I'll contact and request for the custom afterwards. Hope that you will have a great holidays. 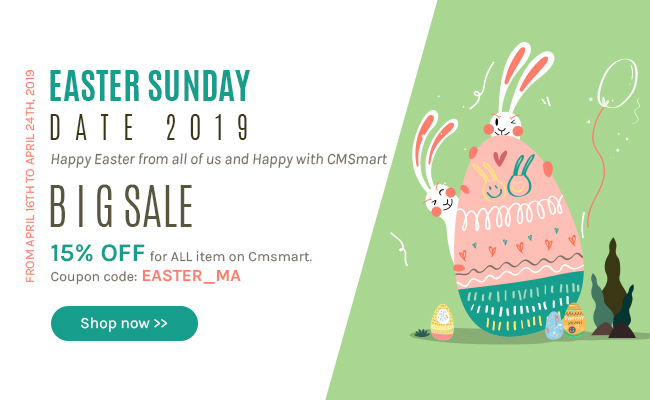 After you purchasing our products, if you have any problems, feel free to contact with me via my email: janet@cmsmart.net. Does this extension work along with child products? Like I choose a color and it will show the corresponding child product? In current version, our product don't support this features. But we will research and develop in the next version. Thank you for your answer and great team effort flexibility. The product SKU of my site is difference from each color, which I manage them with child products. So this feature is very important to my company business. May I know is there a planned releasing time frame about next version contain this features?